StaffMap projects can easily generate Static Floorplans as PDF's. This is to allow other applications or websites to link to the static floorplan, and ensure that it’s always up-to-date. Static Floorplans can also be easily distributed, and emailed to employees as needed. The generated Static Floorplan PDF files are optimized for print and online publications. Select the Tools menu item. Select the Export to PDF menu item. Select the Panel Theme, if required. 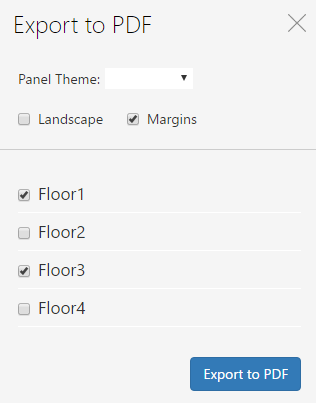 Panel themes can be used to customize the visual look of exported floors. Adjust PDF layout settings with the Landscape and Margins checkboxes. Select the desired floors to be exported to PDF, then press the Print Floors button.